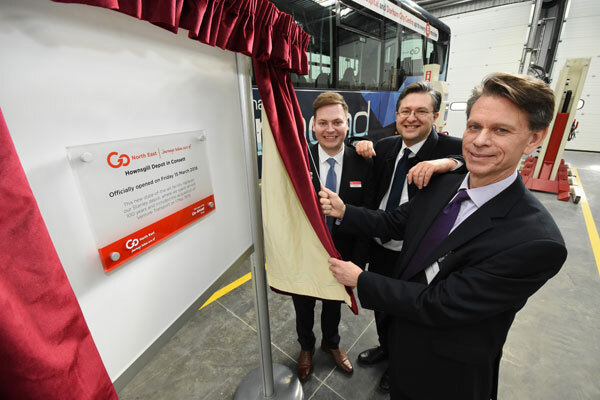 After two and a half years of development, the region’s largest bus operator, Go North East opened the doors to its brand new £3.5 million, state-of-the-art Consett depot in County Durham. In an official opening of the multi-million-pound facility, Go-Ahead Group Chief Executive David Brown was joined by Cllr Simon Henig, leader of Durham County Council and Go North East Managing Director, Martijn Gilbert. Also in attendance were members of the Go North East team, its stakeholders, suppliers and partners to declare the site – which has sustainability at its heart – open. Cllr Simon Henig added: “It’s great to see Go North East demonstrating its confidence in our county and our growing economy by making such a significant investment here. “Public transport is vital to our towns, villages and communities and it is important that we work with our partners to ensure it is reliable and accessible. Located on Hownsgill Industrial Estate in Consett, the purpose-built 8,800m² building has been constructed on a brownfield site, formally part of the old Consett Steelworks. As part of the development of the Hownsgill site, Go North East has shown its long-term commitment to Consett through its development of its Medomsley Road office for its operations team. Refurbishment here – which cost £100,000 – included new CCTV and alarm systems, a new roof and updating of canteen facilities for bus drivers. For more information about Go North East, visit www.gonortheast.co.uk.